Three people were killed outright in the Feb. 27 crash and one of two survivors died Tuesday. Smoke rises from a Riverside home where a small plane crash landed on Monday, Feb. 27, 2017. 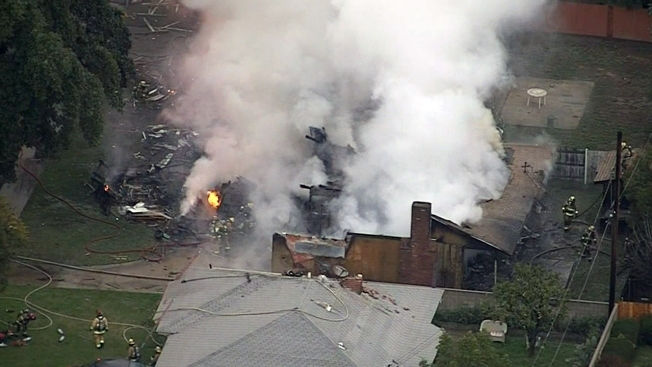 The pilot of a small airplane had difficulty starting one of its two engines before the plane crashed in a Riverside neighborhood last month shortly after taking off, according to a preliminary report by National Transportation Safety Board investigators. 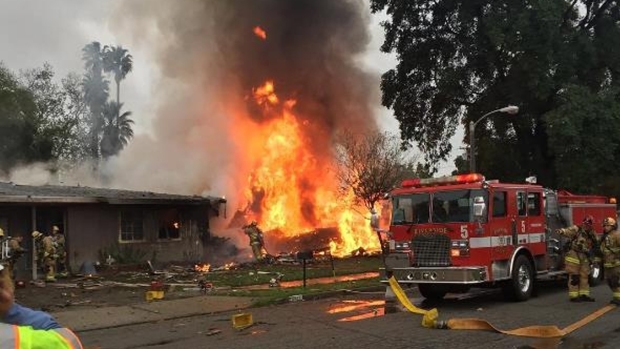 The observation was among accident facts summarized in the report, which makes no conclusions about what caused the fiery Feb. 27 crash in a neighborhood about a mile from the airport where the plane took off in Riverside. The 83-year-old pilot and two other people were killed and a survivor who was pulled from the crash scene and hospitalized died this week. Citing witnesses, the report said the pilot and passengers indicated they were returning home to San Jose and the pilot conducted a walk-around inspection of the plane before boarding the aircraft with passengers. "He started the right engine and then attempted to start the left engine," it said. "After several unsuccessful attempts, the left engine started, and the pilot contacted air traffic control." Weather conditions were cloudy, with 2 miles of visibility, and an instrument flight rules plan had been filed for the plane's trip north to San Jose International Airport. "A preliminary review of (air traffic control) audio revealed that the controller issued an IFR clearance to the pilot multiple times before he repeated the instructions back to the controller correctly," the report said. "Witnesses that were listening to the pilot's communications with ATC reported that the pilot required progressive taxi instructions to runway 09, the departure runway." The controller repeated the departure clearance and the runway departure was uneventful, the report said. The plane then began a left turn as it entered clouds. 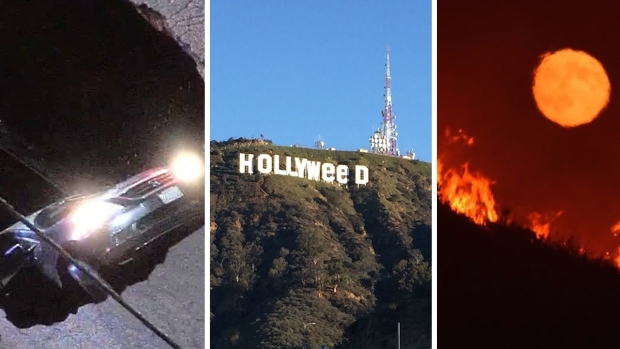 "A portion of the airplane's final moments of flight were captured by a surveillance video, which showed the airplane descend towards the ground in a slight left wing low attitude," the report said. 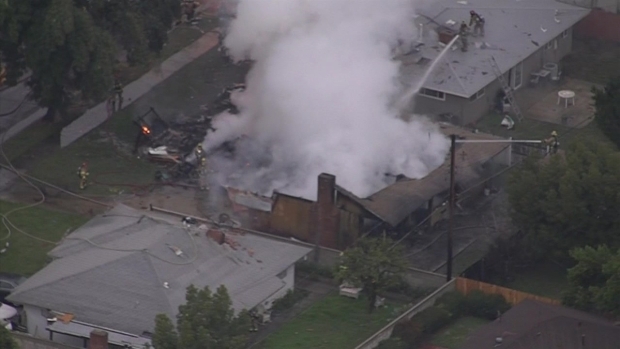 The plane then vanished behind a house and fire erupted. The report described the wreckage but did not say whether there was any indication that either engine was still running at the time of impact. NTSB investigations typically take months before the board determines the probable cause of accidents. Killed in the crash were the pilot, Nouri Hijazi, who has been described as having decades of flying experience; his wife, Dana, 67; and a friend, Adine Ferales, 22. The Riverside County coroner's office lists those deaths as under investigation. The death toll rose Tuesday night when the Hijazis' daughter, Joanne Stacey Pierce, 46, died at a hospital. Another woman, Sylvia Farelas, survived with burns and has undergone surgeries since the crash. The group flew to Southern California to see the young daughters of Pierce and Sylvia Farelas perform in a cheerleading competition. Those girls returned to San Jose with their classmates on a bus.